Surrounded by green mountain walls with snow capped peaks, the valley is of unequaled splendor. Kathmandu city tour consists of three main cities of great historic and cultural interest: Kathmandu, Patan (Lalitpur), and Bhaktapur (Bhadgaon). The valley floor is 1310 m. above sea level. On your day tour, you will be amazed by the number of temples and stupas, carved wooden struts, golden torahs, and images of various gods that remain from past dynasties. For relaxing views of the sunrise and sunset, Nagarkot and Dhulikhel hill resorts are just a few hours drive away. Visits to religious sites give an insight into the great religions of the subcontinent. Festival days relive centuries-old customs. There are many easy day hikes in pleasant bird and animal filled areas. Kathmandu’s most impressive sight, Durbar Square, is crowded with ancient temples and palaces reflecting the religious and cultural life of the people. It is also home to Kathmandu’s Kumari, or ‘living goddess’, a young girl believed to be a reincarnation of the goddess Durga. Swoyambhunath temple, also popularly known as monkey temple, is one of the major attractions of Kathmandu valley. It is 3km west from the Kathmandu city. You will notice a large numbers of monkeys around the temple and at the same time you can also observe the valley below as the temple stands in the height. The stupa of Boudhanath lies eight kilometres east of Kathmandu. This crossal and ancient stupa, one of he biggest in the world, has the all seeing eyes of Lord Buddha. It was built in the fifth century A.D. on an octagonal base inset with prayer wheels. Situated five kilometres east of Kathmandu on the bank of the sacred Bagmati River, the temple of Lord Shiva is famous for its two-tiered golden roof and silver doors. The area along the bank of the river next to the temple is a designated cremation yard. Durbar is a Nepali word and its closest translation in English is a palace. You will see lots of such Durbars in Kathmandu , Bhaktapur and Patan. You will see Durbar squares in front of the old palaces. You will get a chance to see many interesting palaces like the old Royal Palace (Hanuman Dhoka), a number of interesting pagodas and Indian style temples (Sikhara), the House of Kumari (the living Goddess) and the Kasthamandap (or wooden house which is the origin of the word Kathmandu ) and many more things. The first of its kind to be built, this 17th Century temple is the only one in Nepal with shrines entirely carved in stone. The estate is well known for Nepali handicrafts such as wood carvings, metal crafts, carpets, and tonka paintings. Situated at an altitude of 1401metres, this is one of the three ancient cities of Nepal. Bhaktapur covers an area of 4 square miles, and boasts medieval art and architecture as well as thriving local pottery and weaving industries. this spacious, beautiful square is packed with ancient temples and monuments. These include the colorfully named ‘Lion Gate’ and ‘The Bell of the Barking Dogs.’ It’s a great place to explore and absorb local life. The places of 55 windows. The palace of 55 windows was built in the 17th century by the King Bhupatindra Malla. Amid the brick walls, with their gracious sculptural design, is a balcony of 55 windows. This balcony is a masterpiece of wood carving. Built in 1702, this five-story pagoda is an impressive sight. Staring down at you from the terraces are intricately carved figures of wrestlers, elephants, lions and griffins. 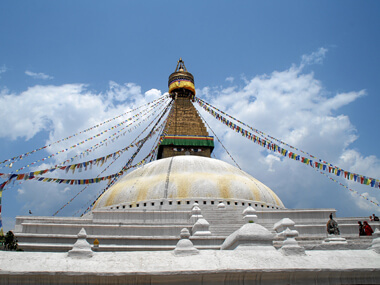 Boudhanath is a huge Buddhist stupa located about 7 km east of Thamel. It stands on a massive mandala style platform and has features similar to the Swayambhunath, though it is bigger than Swayambhunath in size. It is said that this stupa was built during the 5th Century. Every year, Thousands of pilgrims from Nepal and neighboring countries visit Boudhanath, particularly in winter and Pashupatinath temple. Pashupatinath temple is the biggest Hindu temple. After breakfast, our city guide reaches in Hotel with Vehicles, then we drive to Bhaktapur Durbar Square. Bhaktapur is one of the oldest cities in Kathmandu valley. It is well known as Living Museum. Old brick paved enclave of old Royal palace, Nyathapola Temple, Datatriya temple, exquisite artwork offers a picture of the grandeur of medieval Nepal. And Patan is located 7 km away from Kathmandu, this city has many 15th to 17th century, Hindu and Buddhist, monuments built during the Malla dynasty. The most important area with many monuments is the Patan Durbar Square. Over night stay at Hotel.